Those who love to play in the Animas River can look forward in coming months to greater clarity about the concentration of heavy metals in their favorite recreational areas. 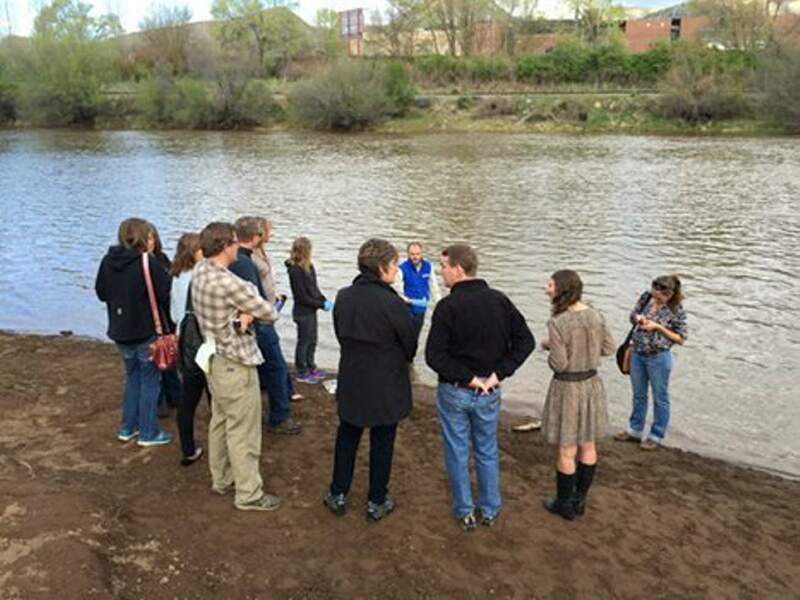 U.S. Sen. Michael Bennet, Durango Mayor Christina Rinderle and La Plata County Commissioner Gwen Lachelt were joined by researchers on the beach across the river from Durango High School on Friday morning to take water and sand samples and explain monitoring efforts. “In the wake of the Gold King spill, we want to ensure our community the river is safe,” Rinderle said. Contamination of river sediment became a public safety concern after the Aug. 5 Gold King Mine spill that released about 3 million gallons of acid mine drainage into the river. But heavy-metal pollution from historical mines above Silverton is an ongoing problem, and data from Mountain Studies Institute collected in February showed that aluminum and iron were at levels that could be unsafe for aquatic life if they persist at that level. Iron remained at an unsafe level for aquatic life in March, according to the MSI report. The Environmental Protection Agency said earlier this week that it will provide $600,000 for additional monitoring, and part of that funding will help San Juan Basin Health Department, Fort Lewis College and the Colorado Department of Public Health and Environment study the river. The EPA initially designated $2 million to all the states and tribes involved for river monitoring. “We know moms and dads are going to want to know continuously the water is safe,” Bennet said. It is not clear how the $600,000 will be divided between the states and tribes, said Nicole Rowan, clean water program manager for CDPHE. But water and sand sampling will happen at the beach, along with other recreation sites yet to be determined, to understand how the spring runoff might change the composition of the sediment over the spring and summer, said Brian Devine, water program manager for the San Juan Basin Health Department. If the researchers don’t find anything concerning, the testing could end in August, he said. He could not say when the data will be released, but it would be shortly after testing is complete. Other long-term testing to better understand the river system and alert public officials to problems also is underway. The U.S. Geological Survey installed three water quality monitors along the Animas in Colorado in March and April that measure acidity, cloudiness and temperature that can indicate higher metal levels. No automated sensor can track the concentration of metals. If any of these indicators reach concerning levels, local researchers receive alerts in the form of text messages, emails and phone calls, Devine said. This allows researchers to physically take samples from the river and then, if necessary, alert emergency managers at the city, county and state levels, Devine said. “We’re pretty sure we’ll have no need for that,” he said. These readings are also available online in real time. 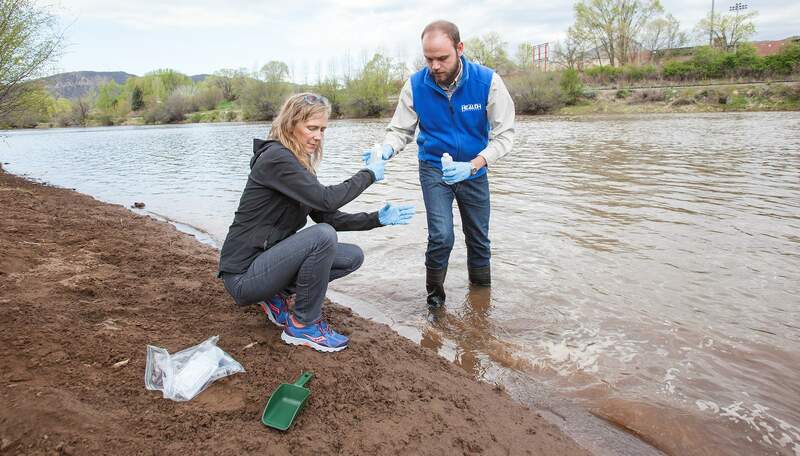 Fort Lewis College also is installing two new Sonde monitors, one at Baker’s Bridge and upstream from the 32nd Street Bridge, said Heidi Steltzer, an associate professor in biology, who has led research on the river. These sensors track similar factors monitored by the USGS and the Southern Ute Indian Tribe. The Sonde sensors also track algae, nitrates and ammonium, which indicate pollution from fertilizer, another ongoing problem in the river. The San Juan Health Department would like to use the additional funding from the EPA to allow for the Sondes data to be live on the web. In addition to these sensors, the EPA maintains 30 sampling sites along the Animas, San Juan and Colorado rivers where researchers regularly gather data, Devine said. Brian Devine, San Juan Basin Health Department’s water program manager, and Marcie Bidwell of the Mountain Studies Institute sample water from the Animas River on Friday at Paradise Beach behind Durango High School. Water and sand testing at recreation sites along the river will help researchers understand how spring runoff affects heavy-metal levels in the sediment. For the Mountain Studies Institute report covering data from March and April, visit www.mountainstudies.org/goldkingspill.For real-time data from the U.S. Geological Survey, visit http://on.doi.gov/1q4pA7C. 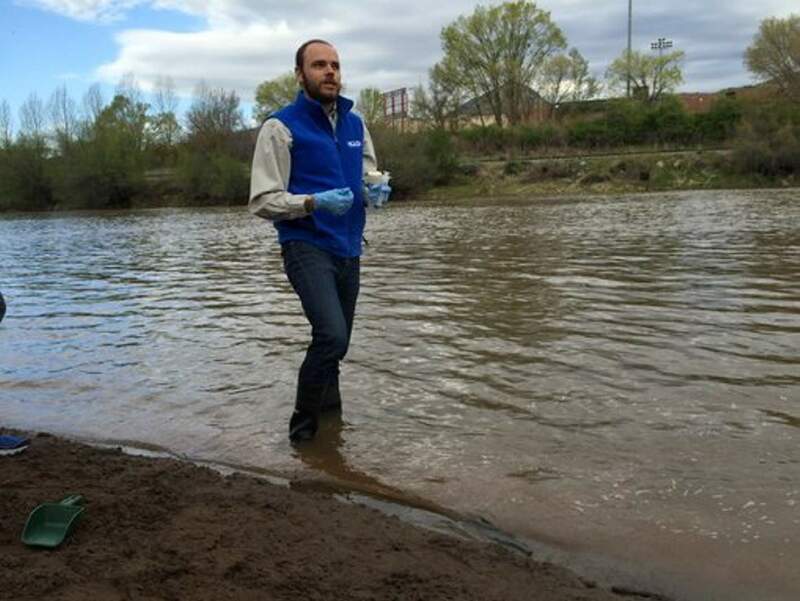 Brian Devine, water program manager for the San Juan Basin Health Department, gathers water and sediment samples Friday morning at a beach behind Durango High School. Officials gathered behind Durango High School on Friday as water and sediment samples were taken from the Animas River. The testing was made possible by a new grant from the Environmental Protection Agency. 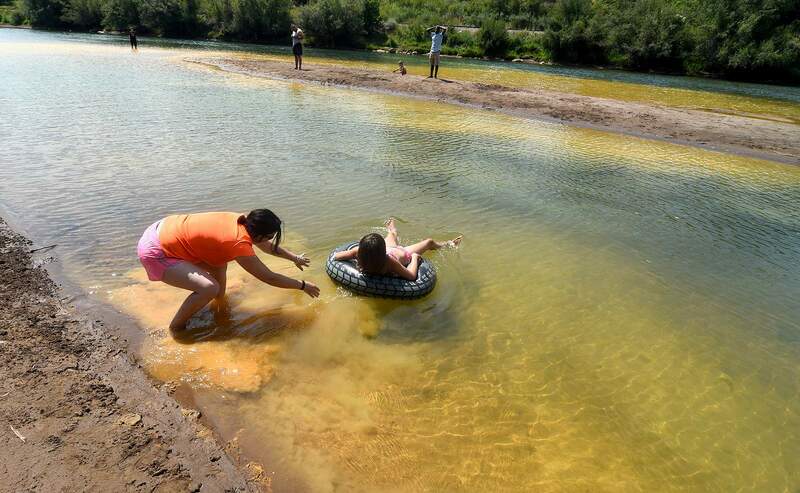 Visitors to the beach on the Animas River behind Durango High School stir up sediment from the Gold King Mine spill in August. Agencies plan to monitor this sediment with funding from the Environmental Protection Agency.